Alison Sokol Blosser is photographed during an oral history interview at Sokol Blosser Winery in Dayton, Oregon on July 6, 2018. Sokol Blosser was interviewed by Linfield College Archives staff Stephanie Hofmann. Also in attendance were Linfield College Archives students Tia Elder and Shelby Cook. Linfield College Archives, "Alison Sokol Blosser Interview 10" (2018). 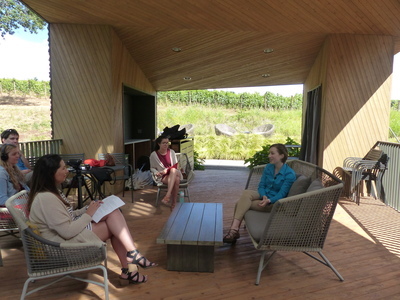 Sokol Blosser Winery Oral History Interview Photos. Image. Submission 27.